INDIANAPOLIS — Neighbors in a south side Indianapolis neighborhood are concerned about pedestrians traffic that is having a difficult time navigating ongoing construction for the IndyGo Red Line Project. Sidewalks on both sides of Shelby Street in the area of Southern Avenue are closed while crews replace utilities. The closures are making it difficult for pedestrians who navigate the area to get around all the work. "You have people walking down the street in traffic because that is where you are stuck," William Balint, who lives on Shelby Street, said. "Why don't you start one project on one side of the road, finish that and then continue instead of this whole zigzag pattern that's going up and down the street. It's unsafe." 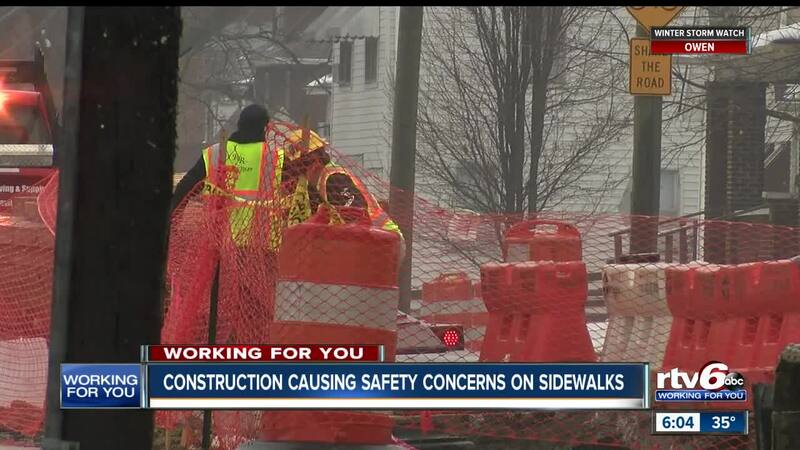 RTV6 reached out to officials at IndyGo about the sidewalk concerns. An IndyGo spokesperson said the issue is being addressed and construction crews are making sure there is a pedestrian detour route — something that is required when construction impacts access to the sidewalk. "The lines are still marked on the sidewalks on the street to rip up more," Balint said. "I understand we are doing this to better the area, but at the same time you are making it worse for residents that have to walk." The Red Line will run from Broad Ripple through downtown all the way to the University of Indianapolis. The project is expected to be complete this summer. For residents living along Shelby Street, they can expect crews to wrap up their work in March.